Plastic doll is wearing the habit of an unidentified religoius order. The doll was labeled by the donor as being a Sister of the Good Shepherd. 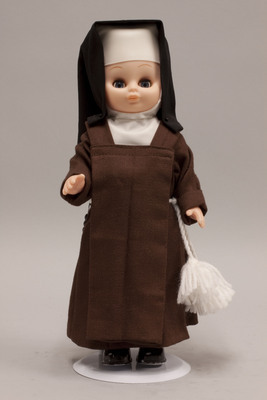 The doll is wearing a brown dress, brown scapular, black veil that is fastened under the chin by a metal chain, and a white wimple. A white yarn belt is tied around the doll's waist, and a rosary hangs from the doll's waist.